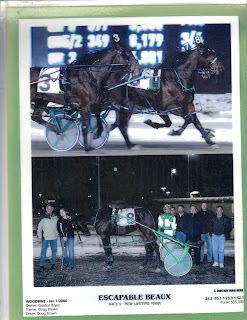 Melissa and Beaux during his early years of racing. When the heart yearns and the faith is kept, sometimes a twist of fate of a celestial blessing happens. This is one such story of a stakes winning racehorse and his devoted groom who reunite after years of separation. It was a rainy and cool 9 degrees C on Friday, April 12, 2002 when Escapable Beaux slipped into the world at Walnridge Farm in Cream Ridge, New Jersey. The state of the art 300 acre historic farm would be the birthplace of Beaux as he struggled to his feet that early morning. Walnridge Farm had purchased his dam while in foal back in 2001 at the Standardbred Mixed Sale in Pennsylvania. Beaux had been bred by the prestigious Perritti Farms who had consigned the mare to auction. Escapable Beaux was sired by the great Artiscape whose record at stud was phenomenal. With 834 wins by his offspring and over $89,000,000 earned in stake races, Beaux was bred to be deep and fast on the track. His dam was Beauteous, a daughter of Jate Lobell. She herself paced in 1:56. She was retired to the broodmare ranks after four wins and produced 8 foals. 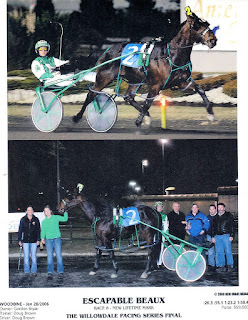 In the fall of 2003, Escapable Beaux was sold as a yearling at the premier Standardbred Horse Sale in Harrisburg, Pennsylvania for $30,000 (US) to a Canadian buyer. 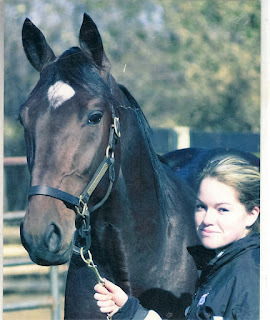 Beaux would later make his debut on the racetrack and eventually find his favourite groom, the passionate horsewoman, Melissa Balson during his early racing days. Melissa handled the strapping and often cocky stud colt with admiration. She understood him and had no difficulty handling him where others did. He appreciated her softer side after long workouts and demanding races. She spent hours massaging his legs, bathing him and fussing over the big colt she stood in awe of. Beaux had a vast and impressive career ahead of him. There was just something about this horse that stole Melissa’s heart. Horse racing can be a heartbreak business and when Beaux moved on to new owners, Melissa never lost faith in the hope she would one day meet him again. And to that end, she followed his racing career with intense interest over the years. In 2007, Escapable Beaux was entered in the Tattersales January Sale. He was purchased for $77,000. It dashed Melissa’s hopes of ever being able to afford the hip price of her beloved Beaux. Still she continued to follow his efforts on the racetrack, whispering from afar to stride boldly and safely to the wire. Beaux’s career didn’t end as a brief drive down the stretch like so many others. No indeed he would endure the rigors of racing for many years. He raced until the age of 12. 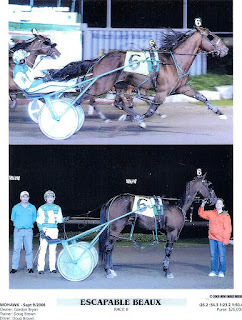 By this point in his lengthy career, Escapable Beaux had won well over $1 million (Cdn) in Stake races and other wins. In total, he dashed under the wire to win 46 races between the age of 3 and 11 years. Rarely if ever was he out of the money. Some of his impressive wins were the Final Western Canada Pacing Derby, the Silver Buckets, and the Final Willowdale Series at Woodbine. He was also named the 2005 ASHA Award Winner for Three Year Old Colts/Geldings. The end of his race days meant the end of the trail for Melissa to follow. As Beaux’s 13th birthday came and went, Melissa was disheartened when she could no longer follow Beaux’s racing activities. She thought she had lost him forever. 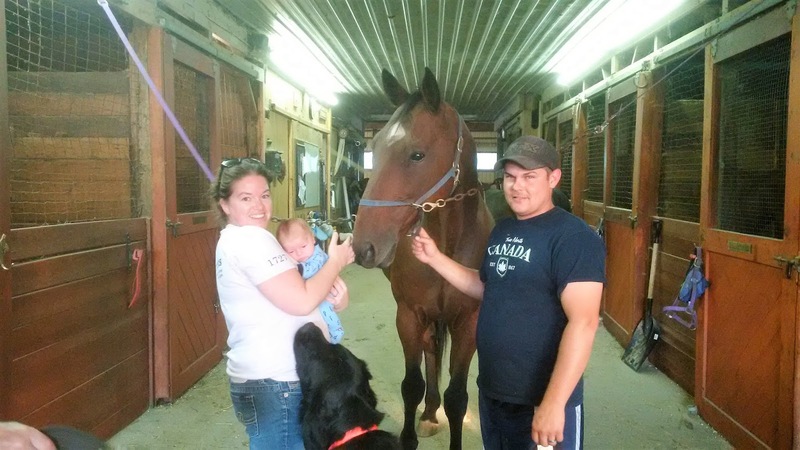 As she searched online for any possible link to his whereabouts off the track, a curious video of a big stout Standardbred caught her eye. It was wearing a western saddle on its back but she would know that unmistakable look and gait anywhere. It was her Escapable Beaux. Ecstatic to discover she had found him, she immediately made inquiries only to be disappointed to learn he was no longer available. Thankful for the fact that Beaux didn’t end up in the slaughter pipeline, it eased her mind to know he was at least safe and surprising sound and fit. Far from the racetrack that had been his only home, Beaux had begun saddle training. Melissa shared this exciting news with her husband. He rather shrugged it off, not wanting to let on that he had already purchased the horse as a surprise Christmas present. He pleaded his case for having Beaux explaining how much it would mean to his wife. Beaux would finally be reunited with the one person in his life that had always loved him, win or lose. Her husband had the horse shipped all the way back to Ontario, Canada from the deep south in the US. I can only imagine the tears and smiles when the lead shank and papers were passed to Melissa. She finally owned her beloved Escapable Beaux. There was one last thing Melissa had always dreamt of. She would like to have Beaux race one more time under her silks. He had been off the track for 14 or 15 months and at age 14, this was the last shot at ever pacing down the stretch again. (Standarbreds must retire after age 14.) Melissa went to task putting Beaux back in training. He qualified to race and with husband Kyle on the lines, Beaux thundered down the track once last time. It wasn’t about winning a race, it was about accomplishing the impossible dream. Escapable Beaux returned to saddle training and Melissa is enjoying being atop her famous horse. This is a new venture for both of them. Both are more accustomed to being in harness - he between the shafts; her on the lines. Together they are discovering a new world of locomotion. Instead of the view from behind, Melissa is looking outward and forward. Beaux no longer has blinkers on and is learning to trust his rider from above. They were making remarkable progress. But Melissa had to take leave for a bit. Most recently she gave birth to their first child. They had already decided on a name if they were to have a son. Beau Russell entered the world not knowing he was named after an incredible horse and love story for the ages.